Cobalt Digital has revealed that AT&T is using high dynamic range (HDR) technology from Cobalt and Technicolor to bring more vivid and realistic images to 4K broadcasts of live "MLB Network Showcase" games on its DIRECTV® satellite service. The integrated solution from Cobalt and Technicolor addresses the needs of production truck operators working with a mix of SDR and HDR systems by allowing them to create HDR signals easily from existing SDR sources, such as cameras and graphics systems. Technicolor's ITM SDR-to-HDR process manages brighter highlights and darker shadows to deliver more realistic images for the most compelling and immersive entertainment experiences. In addition to supporting live broadcasts, this real-time analysis and adjustment capability offers broadcasters an immediate opportunity to unlock the millions of hours of existing SDR content and release it into an HDR world. Another advantage of using Technicolor's technology is its ability to tone-map HDR signals into SDR signals while creating SL-HDR1 metadata that is then inserted into the SDR signal for use downstream. This capability means a network service provider only needs to transmit an SDR feed to the viewer, and if the viewer has compatible equipment (TV or set-top box), the system will automatically "rehydrate" the signal to deliver a full HDR experience. This process is called Technicolor HDR, and the technology will reside in the Cobalt 9904-UDX-4K by the end of the third quarter. At that point, the 9904-UDX-4K will be the only baseband processor needed to create HDR and deliver it over existing SDR-capable networks. 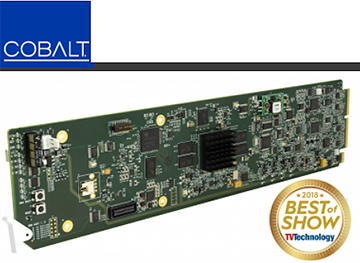 Cobalt Digital is the first U.S. manufacturer selected to license Technicolor's HDR ITM technology for the broadcast television environment, and the technology is available as an option for Cobalt's new series of 12G-SDI 4K cards for the openGear® platform.